Is a Lottery Win the Longest of Long Shots? Winning the lottery can be life-changing. With prizes reaching the multi-millions, a winning ticket can catapult you into a life of perpetual leisure, luxury goods, and even the occasional charitable donation. But lottery jackpots can often seem like the longest of long shots, so we crunched some numbers. Ever wondered how good your odds are of winning big? People have been wondering the same thing for centuries. Even the great mathematician Leonhard Euler dedicated a portion of his writings to figuring out games of chance – most prominently, the Genoese lottery. Now, we don’t know if Euler himself ever joined the lottery, let alone won it. But his efforts tell us that figuring out your exact chances only requires a bit of math. How’s that for lottery being a numbers game? As our infographic illustrates, that often means a lot of luck: The jaw-dropping millions you’re playing for might look impressive, but they’ve got nothing on the odds you need to beat to win. Your chances differ slightly depending on your chosen game, of course: a lottery that asks you for 6 numbers from 42 presents more reasonable chances than one with 59 balls in the draw. But as our infographic shows, either way, the more impatient among us might want to try scoring a date with a supermodel instead. Should You Give Up on the Lottery? Does this mean you should stop buying lottery tickets altogether? Heck, no! Let’s put it this way: Many of the things more likely than a jackpot win are unpleasant contrasts at best. Sure, it might be statistically easier to drown in a bathtub or get squashed by a meteorite, but would you really want to? On the other hand, a single lottery ticket might be almost ten times less likely than those ridiculous deaths, but getting lucky is much less painful. If you’re going to push your luck, it might as well be with something that offers a much more desirable prize. Keep in mind, too, that these odds don’t give you the full picture. At first glance, a 1 in 1.5 million chance of becoming the next George Clooney might sound better than your odds for the SuperEnalotto jackpot. The numbers certainly think so. But probability doesn’t mention all the hard work, talent, and connections you’ll need to even put yourself in contention to be a movie star. Before you can even hope to apply that 1 in 1.5 million chance to your career, you’re going to have to build a career from scratch first. The same goes for your “better” chances at being President of the United States. To actually make good on those odds, you’ll need a political reputation, lots of money and resources, and the sheer stamina to get through a long, laborious, and expensive campaign. Oh, and of course, you’ll have to win over millions of people across a whole nation. Don’t even get us started on what you’ll need if you want to be considered for a sainthood. Compare all that to a lottery ticket, which doesn’t care how many acting classes you’ve taken, what your polling numbers are, or whether you’ve ever turned water into wine. 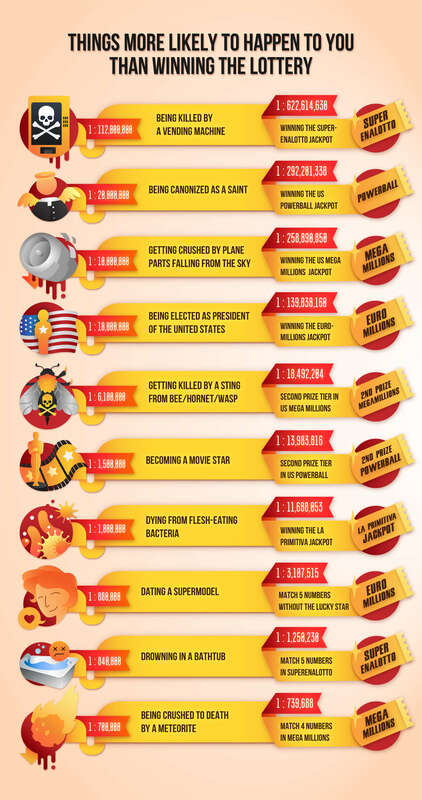 While other possibilities like the US presidency, canonization, or a star on the Hollywood Walk of Fame depend on many other factors besides statistics and luck, the lottery is a fair playing field. Unlike other life-changing events, at the lottery, testing your luck is as simple and easy as forking over some spare change. The odds of winning the lottery might seem astronomical, but there are plenty of things that are less likely to happen. Think you’d fare better if you played your cards right? It turns out the lotto might be a safer bet than a string of good hands. A royal flush might be doable, but getting several royal flushes in a row is a 1 in 957,000,000 chance. The SuperEnalotto jackpot looks much more attainable in comparison—and you don’t even need to sit through several nerve-wracking rounds of bluffing to have a good shot. If you’re looking for an easy score, you might try selling signed sports merchandise instead. Many baseball fans take this route with foul balls they’ve caught during an MLB game. One signature from a pro, and those balls net a decent sum. But making a reliable business out of foul balls might be a bit difficult. To catch 4 in a single game, you’d need to beat 1 in 1 trillion odds. Here’s the good news: someone’s already done it. 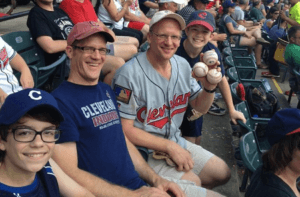 Greg Van Niel, a Cleveland Indians fan, caught four foul balls in a Cleveland Indians vs Kansas City Royals game. In fact, people like you and me carry out statistically impressive feats every day. That’s not an exaggeration. Dr. Binazir went as far back as the beginning of human history to see how events in the past could have lined up and led to your existence. After all, one instance of divergence—however slight—would have produced an entirely different result. His conclusion? The odds of existing is a ridiculously staggering 1 in 102,685,000. And like royal flushes or Greg Van Niel’s feat, people beat those odds every day. In fact, you’re reading this right now, which means you’ve beaten what might be the most absurdly difficult lottery there is. Compared to all the chances that had to align to get you to where you are, what’s buying a few lottery tickets? Every lottery ticket is a gamble, and not everyone has the luck to win hundreds of times. For many of us, million-dollar jackpots are a once-in-a-lifetime opportunity, if at all. But as our infographic shows, the lottery is a rare gem that combines potentially enormous returns with an unbelievably low barrier of entry. You don’t need anything other than a purchased ticket – and that makes it easy to keep trying until you beat the odds. So play on, and maybe that lottery win will find you before the vending machine does. Want to get more strategic with your efforts? Check out our guides to lottery prediction tools and common lottery strategies, too.